After making some of the most brutal, breathtakingly aggressive, all-hell's-a-breaking-loose music ever created, being one of the four bands that defined an entire musical genre and being the band that other heavy acts are measured against and aspire to...after nearly 37 years, releasing 12 studio albums, multiple live recordings, compilations, live video and two box sets, playing nearly 3000 concerts in all corners of the world, receiving countless awards including five Grammy nominations and two Grammy awards, Gold records and other accolades...having its own exhibit in the Smithsonian Institute, gracing hundreds of magazine covers, experiencing the devastating loss of a founding brother, and even appearing on "The Tonight Show," the age of Slayer, one of the greatest thrash/metal/punk bands of this or any age, is coming to an end. 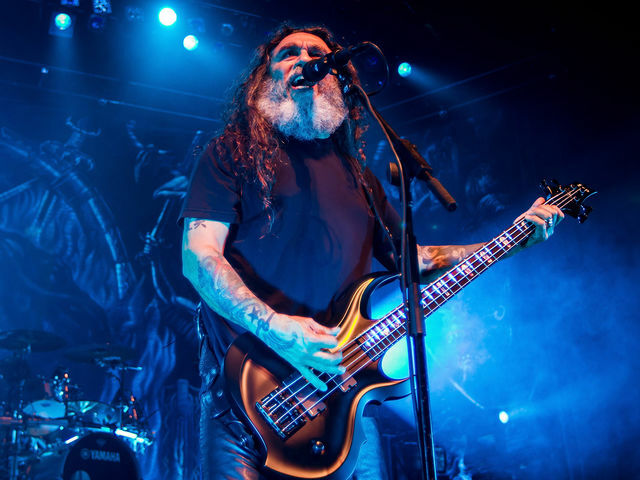 Slayer announces that it will do one last concert tour around the globe to thank their fans for all of their support over the years, for making the last three-and-a-half decades so packed with good times and unforgettable experiences, and will then move on. Lamb of God, Anthrax, Behemoth and Testament will support Slayer on the first leg, North America, of its final world tour.